Climate variability and change is one of the most serious threats to mankind and already affects smallholder farmers in Zambia. Irregular rainfall patterns causing variations in the onset and cessation of rainfall always have a direct impact on famers’ lives with unforeseen consequences on food security and income. Technologies that reduce drudgery, conserve moisture and improve soils fertility over time reduce these risks especially in bad seasons. Mr. Richard Soko is a farmer who resides in Mugubudu village in Chief Chanje chiefdom under Chanje Agriculture Camp in Chipata District of Eastern Province. He is one of the farmers who has been hosting a conservation agriculture (CA) validation trial implemented by Total LandCare and the Ministry of Agriculture and Livestock under the SIMLEZA-AR project since the inception of the project in 2011. 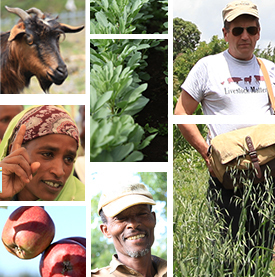 Mr. Soko had been practicing conventional agriculture for 16 years on his 2.5 ha of land before the project started. He grew maize continuously and some tobacco. He traditionally tilled manually creating ridges with the hoe or using a plough, planted locally available hybrids and applied four bags of fertilizer per ha and on average harvested four tons of maize. 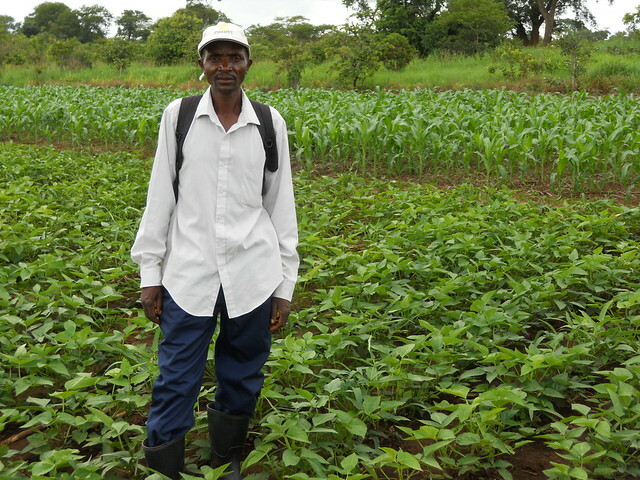 Since 2011 Richard Soko’s life has changed: he now uses direct seeding (ripper), practices crop rotation with cowpeas, plants improved maize seed and applies the recommended fertilizer rate of 8 bags per ha. When farmers in southern Africa in 2014/2015 experienced the worst cropping season of the last decade, enduring a late start and early ending of rains with dry-spells in between, Mr. Soko was able to harvest 6.75 tons of maize from his land. He kept 1 ton for home consumption and sold the rest, making US$1,014. He bought a treadle pump for US$180 and has set aside US$300 for inputs in the next season and put the rest in his saving account. Such is the impact appropriate technology can have on smallholder farmers. “I want to sincerely thank the SIMLEZA-Africa RISING project for bringing new technologies such as conservation agriculture. It has taught me about ripping, planting with a dibble stick, crop rotation and intercropping with legumes, and herbicides application. I learned a lot from my fellow farmers, researchers & extension officers during evaluations and field tours” Mr. Soko said. He also participates in a Total Land Care radio program aired by a local radio station -Radio Breeze to explain what conservation agriculture technologies are, how they work and how he has benefited over the years. Tags: CIMMYT, Conservation agriculture, IITA, total land care, zambia. Bookmark the permalink.